Growing up I was afraid of the dark. I forced my parents to leave the hall light on outside my bedroom so I could settle down and sleep. And if I ever woke up in the middle of the night my eyes would long for light. We lived on the corner of a busy street and when cars would drive past a rectangle of light would zoom around my room. So I would wait longingly for the next car to drive by so my eyes could follow the rectangle of light around my room. I always looked for the light. But the darkness of life can cause us to fear, doubt. At some point we may stop looking for the light. Stop seeking God’s way in the midst of the dark. There we stumble around unsure of God’s grace, does He even care? But God, He wants us to see, to seek, to wait for Him. 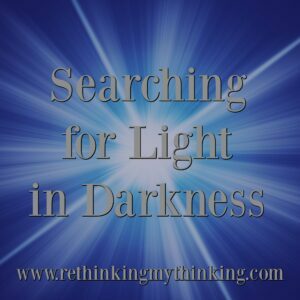 So God blesses those looking for Him in the midst of the darkness. Those who point to the tiny light they see on the horizon or the beautiful sunburst they glimpse through the clouds. Those are the wise ones, the ones who dare a world to see even though they refuse to see the light and remain stubbornly comfortable with darkness. Seeking the light requires us to stop looking at only our circumstance and to start telling our circumstances about our God. It is time to speak God’s light in the darkness, seek His light to shine in the unlikely places. We must tell others about His redemption, love, and justice. Only then do we see His Spirit moving, working, growing. May we be seekers of God’s light coming. May we encourage others to do the same. Father God I confess I often let the darkness of this world weigh me down. I often forget to lift my eyes to seek Your light, Your dawn, Your second coming. Forgive me for being overwhelmed by the darkness. In the power of Your Spirit help me to be like Anna and Simeon, hopeful, trusting You, seeking Your light. And as I seek for Your light may I speak about Your love, redemption, and justice. May Your Name be made great and Your kingdom expand as I seek Your light. In Jesus’ Name I pray. Amen.